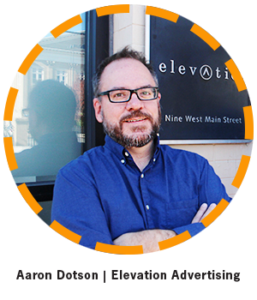 Join us in welcoming Aaron Dotson, principal and creative director at Elevation, to the Baskervill blog! He’s Richmond Ad Club’s Advertising Person of the Year and a legit Star Wars fan (saw The Force Awakens three times during opening week). It was quite the shake-up moving from a position of working with clients to becoming the client. In this guest post, which originally appeared on Elevation’s blog, Aaron shares what he’s learned about fostering collaboration where people get stuff done and are genuinely proud of what they’ve accomplished together. For this edition, we’re going to throw in some “Timisms” from this mission’s lead project designer to share our team’s experience. Late last year, our office began planning an expansion of our physical plant. 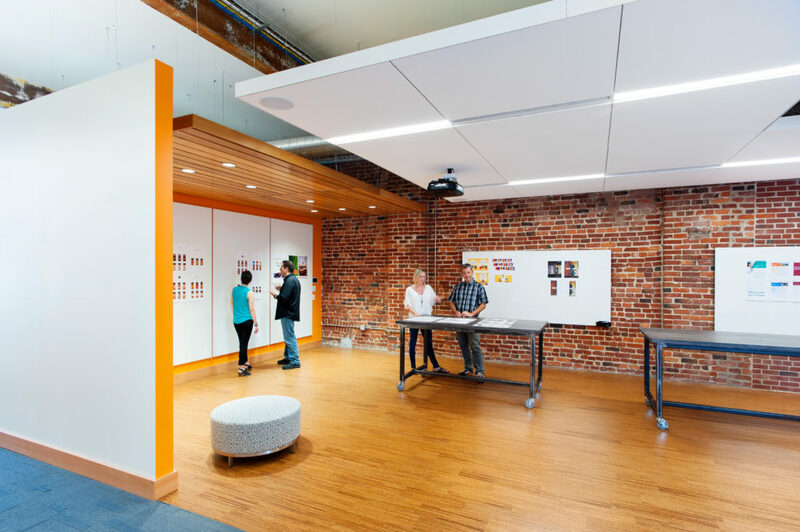 We called our longtime architects, Burt Pinnock and Tim Hamnett of Baskervill, and asked them to help us design the office of tomorrow for our growing firm. In the months that followed, I found myself confronted with the same kinds of challenges that I imagine our own clients face when working with creatives. The process was enlightening—and reminded me of several elements that make the difference between a successful collaboration and one that leaves all parties frustrated. Have a vision, a goal and set of priorities. Our work with the architects began with a lot of discussion about our hopes, dreams and needs for the new space. This was critical because it provided not only a blueprint for the work that followed, but also a measuring stick to evaluate future elements of the plan. As the design evolved, we were able to look at the changes through the lens of the overall vision. This provided critical guidance for our decision-making (see #4 below). But give reasons for the opinion. That almost made me feel less guilty. The truth is, I’ve spent over two decades hearing variations of “I don’t like it” when a design is submitted. Fair enough. But what makes that feedback valuable is when you get a clear understanding of what the client didn’t like, and most importantly, why. Because without the explanation, the designer has no clear path to a better solution. Be collaborative. To a point. We came to the design process filled with ideas. We have ten years of knowledge about what we like and don’t like about our current space, and have accumulated a lifetime of design references from experiencing countless creative spaces around the country. We brought those ideas to the table as Burt and Tim worked through their design. The challenge was stopping there. Because we are creatives with access to design tools, it was tempting to go a little further. At one point, we provided some feedback about a new feature in the lobby that wasn’t quite what we wanted it to be. So our instinct was to sketch out what we were thinking. And we did just that. But then we looked at each other and said “you know, it would be wrong to do this to them” and we put away the paper. Instead, we went back to the design team—not with a solution but with a challenge: We want something more dramatic that makes more of a statement. Then we sat back and waited for their solution. Guess what? It was better than our sketch. Be budget conscious, not budget foolish. 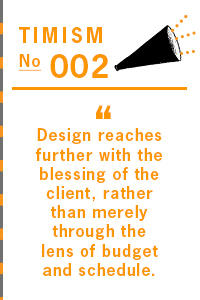 Like every client, we were working with a budget. And we discovered that some elements of our design pushed us beyond it. Yet rather than take a “slash and burn” approach to the plan, we used the original project goals and priorities to determine which elements were mission-critical versus aesthetic luxuries. For instance, it was tempting to eliminate some acoustical elements from the design to save money. And our first instinct was to do just that. Then Tim reminded us that one of our core identified needs for the space was better sound management. He was right. It was time to put our money where our mouths were at the beginning of the planning process—and be willing to commit to a solution that met our long-term goals, even if it meant stretching the budget. Trust the experts you hired. There were times when we were presented with things that we didn’t quite understand, and the creative directors in us (who hate taking no for an answer) would push back on the team. 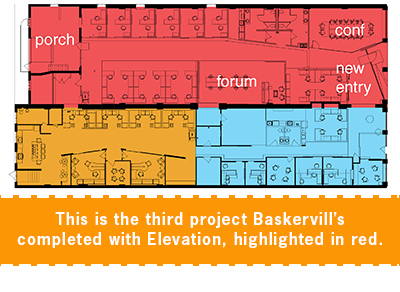 We asked a million questions, and most of those questions started with “why…” The Baskervill team was kind enough to explain everything clearly. But even then, there were times we didn’t like the answers. Yet, we are not architects. We are not structural engineers. We are not contractors. In the end, we had to take a hard look in the mirror and remind ourselves that we had hired these experts for a reason—and that they have extensive experience delivering great work for their clients. Our job as the client was not to be a control freak, but to be a champion of the vision, and to provide the kind of feedback and support that would help these proven experts deliver a design that would meet our objectives and make us all proud. See more photos of the completed design here.